Vedic astrology has proved that transiting planets have profound impact on every individual in their day to day life. Janma Nakshatra or Birth star has an important place in ones chart and often has been used as the starting point for predictions resulting from transiting planets. Kota Chakra is one such tool which can be used to predict the good & bad happenings in one’s life resulting from transiting planets at a particular moment of time. Kota (कोट) is a Sanskrit word, means fort. Kota Chakra is fundamentally a diagram depicting transit routes of planets through 28 Nakshatras, including Abhijit. In ancient times, Kota Chakra was erected for a designated time to predict the outcome of war / battle and the result of fighting between two warlords. In today’s context the chart provides information regarding professional setback, transfer, termination, failure and fall from the position, bodily discomfort, outcome of a dispute or lawsuit, destruction and death. Kota Chakra, also known as Durga Chakra (दुर्गा चक्र), is a quadrangle diagram comprising four divisions. Two small squares inside expands into a large square that forms three segments, while fourth segment is the outer boundary of large square. The figures are divided into two halves by a vertical straight line or a pair of straight lines :these are then further divided into two – and thereby resulting in four quarters – by a horizontal straight line or a pair of straight lines. Thereafter, two diagonal straight lines or two pairs of straight lines are used for making further divisions. Thus the chart is divided into 8 parts. Please see the figure below for better understanding. The placement of 28 Nakshatra in Kota Chakra always begins with Janma Nakshatra, which is placed in the North Eastern corner of diagram. Stambha literally means pillar that support a building. In Kota Chakra, it is the central courtyard. This innermost portion of the Kota Chakra is indicated as green coloured box in above figure. Counting from Janma Nakshatra; 4th, 11th, 18th and 25th constellation falls in this division. If a native’s Janma Nakshatra is Rohini then Punarvasu, Chitra, Uttarashada, and Revati form the Stambha Bhaga of his Kota Chakra. It lies in between inner and outer divisions of Kota Chakra. 3rd, 5th, 10th, 12th, 17th, 19th, 24th, and 26th Nakshatra from Janma Nakshatra falls in this portion. Following this distribution, if Rohini is the Janma Nakshatra then Ardra, Pushya, Hasta, Swati, Purvashadha, Abhijit, Uttarabhadra and Aswini constitute Madhya Bhaga or Durgantara. Prakaara is generally the outer boundary, edge or walls. This portion of Kota Chakra is depicted here in pinkish red colour. Counting from Janma Nakshatra, 2nd, 6th, 9th, 13th, 16th, 20th, 23rd, and 27th Nakshatra is placed in this division of Kota Chakra. If someone is born in Rohini Nakshatra then Mrigashira, Aslesha, Uttaraphalguni, Visakha, Moola, Sravana, Purvabhadra, and Bharani form Prakaara Bhaga. Bahya means outside boundary. This outermost division is the portion that surrounds the rest of Kota. Bahya Bhaga comprises 1st, 7th, 8th, 14th, 15th, 21st, 22nd, and 28th lunar constellation from Janma Nakshatra. Following this if somebody is born with Rohini Janma Nakshatra, the Rohini, Magha, Purvaphalguni, Anuradha, Jyeshta, Dhanista, Satabhisha, and Krittika lie in this area. Kota Swami is also referred to as Durgapati. It literally means Lord of the Fort. Kota Swami is simply the Lord of the Rashi in which the natal Moon is posited. For example, if someone was born with Moon in Taurus then Venus should be his Kota Swami of Kota Chakra. Kota Paala literally means Guard of the Ford. Paala also signifies one who tends and cares. Finding Kota Paala is bit difficult and cumbersome. Kota Paala is the lord of Pada of Janma Nakshatra as per Avakahada Chakra (आवकहदग चक्र) and is the planet representing the initial sound /first letter of the native’s name. Kota Chakra generated for Bangalore at 1800 hrs on 02 June 2011 for native born on 6th February 1985. His Moon was in Leo / Magha 3rd Pada and hence his Kota Swami is Sun. 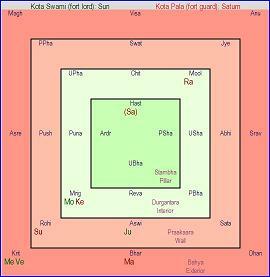 Kota Paala is Saturn. The ‘Stambha’ and the ‘Madhya’ regions constitute heart of the Kota Chakra. Natural and functional benefic planets in this area indicate strength and ability to face adverse impacts; natural and functional malefic planets may do the reverse. The ‘Prakaara’ and ‘Bahya’ regions represent the circumstances and surroundings. Natural and functional malefic planets indicate adverse circumstances but natural and functional benefic planets indicate improved condition. If natural malefic planets transit through the Nakshatras that are placed on the course of “Entry Path” and at the same time, natural benefic planets transit on “Exit Path” forms Durga Bhanga (दुर्गाभगांर्) yoga. This yoga indicates defeat. If natural benefic planets are on the “Entry Path” and natural malefic planets are on the “Exit Path” then one wins the battle. Auspicious results accrue when Kota Swami transits Madhya Bhaga or Durgantara, and Kota Paala transits Bahya Bhaga. If fast moving planets like Moon, Mercury, or Venus becomes the Kota Swami or Kota Paala, and transits through adverse positions, they may not do much harm due to their fast movement. But if Saturn happens to be a Kota Swami or Kota Paala, and transits through these positions , then it is a matter for concern. Rahu & Ketu are always retrograde and therefore the ‘entry’ becomes ‘exit’ and vice versa. Similar is the case for ‘Retrograde’ planets. Commencement of “Retrogression” of any planet is always bad. In case of natural malefic planets, it is indicative of accidental mishap, untoward happening, etc; and in case of natural benefic planets, it signifies withdrawal of support or protection. This is a vast subject and requires extensive reading and research. I have endeavoured to give a glimpse of the same and serious students of astrology are advised to go through the following classics / books for a comprehensive understanding of the subject. Like any other method used for transit prediction, the result obtained from this method also has to be corroborated by the Dasha – Bhukti currently running for the native. Therefore do not be hasty in coming to conclusion using results of this method only. If Dasha – Bhukti is good, many results may have to be moderated or some of them may not even happen. Kota Paala is the lord of Pada of Janma Nakshatra as per Avakahada Chakra (आवकहदग चक्र) and is the planet representing the initial sound /first letter of the native’s name. eg. my Janma Nakshatra is aslesha 4 th and pada-kota paal is mercury, my name ganga-dhanista nak mars lord. whom should I consider as Kota Paala? In olden days people used to (Many even today) name their children based on the letter assigned to the Pada of their Janma Nakshatra. So that is what the sentence means. If you have not been named as per the chart, you have to take the lord of the pada i.e. Ashlesha 4th Pada the Lord of which is Mercury as the Kota Paala. I am correct and you are wrong. Hope you will acknowledge.